OTTAWA, ON – April 9, 2019 – Canadian schools are taking up the challenge to recycle old and unused cell phones for the Earth Month Challenge. This year, the Earth Month Challenge has seen a surge in registrations across Canada, particularly in British Columbia, Manitoba, and Nova Scotia, where the number of schools registered for the challenge has more than tripled compared to 2018. 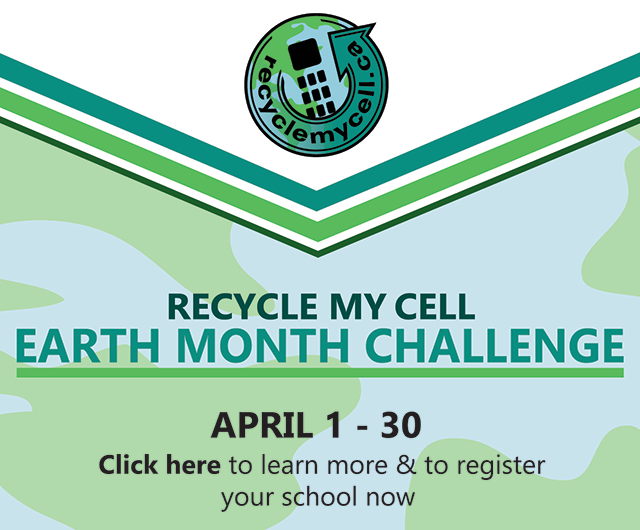 During April, Canadian students and their families taking part in the challenge can collect old cellphones they are no longer using and recycle them for a cash reward. All schools that collect a minimum of 20 devices will be rewarded with $1 for every phone they collect. Additionally, a grand prize of $500 will be awarded to the top school in every province and territory. The winning school will be determined using the number of phones collected per student, based on school population, meaning that schools could win a combined prize payment of up to $1000. Cell phones collected at other times of the year are ineligible for the Earth Month Challenge, but are still eligible for free recycling at a Recycle My Cell drop off location. Official rules for the Challenge are available on RecycleMyCell.ca. The Earth Month Challenge is held by Recycle My Cell, Canada’s free cell phone recycling program. Recycle My Cell is Canada’s national recycling program for mobile phones and accessories. The bilingual website – www.RecycleMyCell.ca and www.Recyclemoncell.ca – allows consumers to simply enter their location to find the drop-off locations closest to them where their devices will be accepted, regardless of brand or condition. The free program is run by the Canadian Wireless Telecommunications Association (CWTA), in conjunction with cellphone carriers, handset manufacturers and approved processors, who have come together to raise awareness about the importance of cellphone recycling.